Add as many tracks as you want and re-order them any way you like; enjoy the new compact design. Create videos with any of the five themes, using specific music, titles, and transitions. Titles, Stickers, Crop, Pan & Zoom, and other tools are now easier to work with, thanks to guides in the preview screen. Save your video project on a flash memory card so you can continue working with it on another PC. Now you can create multiple tasks for schedule recording. The program will be reminding you before it starts capturing. Convert video from cameras in the TTS format, as well as files encoded with the UT Video Codec. 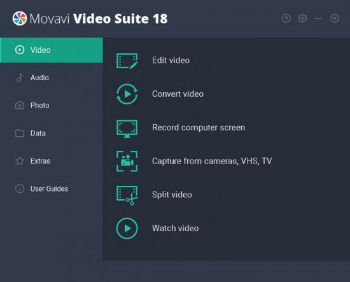 You can choose from a built-in library of creative filters and apply them to the video you want to convert. New features that lets you do trimming and rotating without converting your file. Now you can apply the desired subtitles, audio track, or bitrate to all videos you’re converting in just one click. Users of AMD Radeon video cards will be able to convert 2K and 4K files up to 2 times faster.